The view from my B&B room in Weymouth Saturday morning around 8am (yes zoom lens and a room with sea view very close to the beach). It didn’t look very promising so we headed to a cafe for a coffee and the Saturday Guardian. I think the dogs are more depressed because of the ridiculous jackets they are wearing than because of the rain. … and it all looked much, much better. 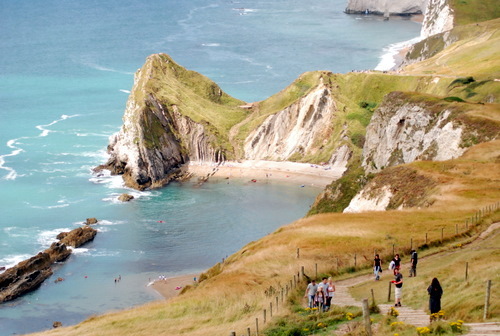 We decided to walk the one mile from Lulworth Cove to Durdle Door, and did not regret it. 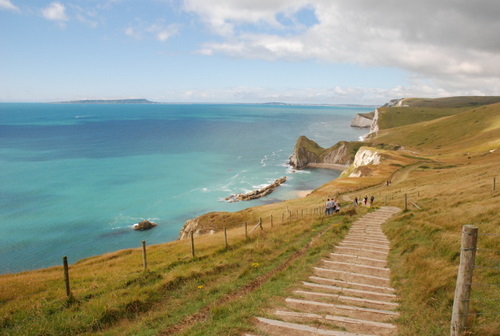 It is a pretty steep walk, up and down the cliffs, but the breath-taking views are so worth it. What a beautiful area. You can see Portland island in the background on the left. And with my zoom lens I could even spot Portland Bill. This is Durdle Door on the left, it has a nice beach down there that could easily be mistaken for a beach on the Caribbean. To get back to Lulworth you do have to climb the same hills, and I admit that my legs had a serious work out. A local ice cream and a view on Lulworth cove made me forget that rather quickly. On Sunday it wasn’t that sunny, but it was dry. We played a round of Pirate Adventure mini golf first in Weymouth (yes we are 12 indeed) which I lost big time. And after that we went back to Portland Bill. Not only because they have great scones with cream and marmalade there, but also because Bill was open this day for a visit. (Portland Bill, weirdly enough, is closed on Saturdays). So we climbed the 159 steps to the top and had a view like the one above. 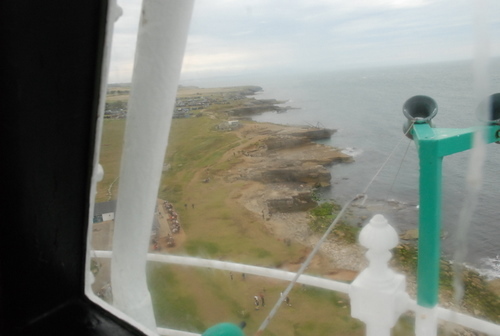 Unfortunately it is not possible to get outside from the top of the lighthouse, there is no balcony like there was on the South Foreland lighthouse. 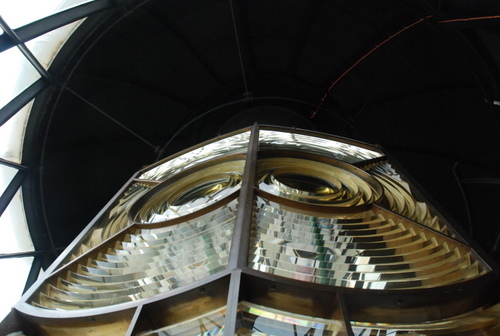 So that was a bit disappointing, but it was good to see the lighthouse from the inside. After a short visit to Chesil Beach, we ended our weekend with a meal in the pub before I took the train back to London. When I came home I realised how relaxed my weekend had been, I had forgotten all my worries. It didn’t take long before they returned, I need to get back to planning my film now. The meeting with the casting director is at 6.15pm tonight. How big’s your zoom if that isn’t an impertinent question!? Did your feet feel like pap after the 159 steps in Bill?? and what about your fear of heights? good to see you have a wonderful weekend. It is not superfast when auto focussing, but fast enough, and for me as an amateur it does its job very well!! 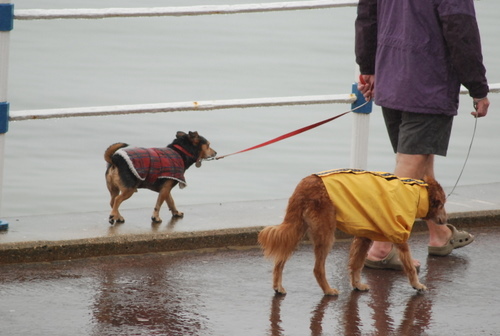 I have to say, for this “dogs in raincoats” shot, they were just on the other side of the street and I was only on the first floor of the B&B, so did not need to zoom that much to catch them on a photo. Photo profs might advice you to buy a more expensive zoom, but I am quite happy with this one. It’s quite light (as in weight) too. @Miek – no jelly legs this time :) Bill has fairly “fear of heights” friendly steps! oh, those pictures are breathtaking – I want to go there immediately. I’m glad you returned rested, relaxed and ready to get back to work! Despite the weather I want to coem back to the UK. Looking at the pictures make me almost homesick. Is that strange, or what? @Pedro – good to see you back :) Did you have really bad weather when you were here? 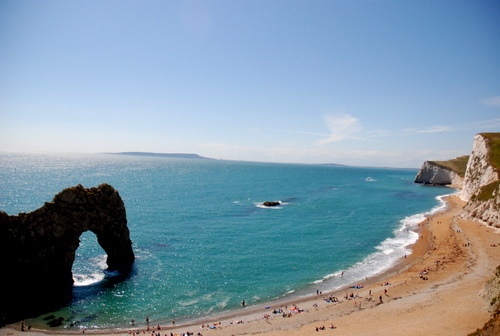 And no it is not strange, I think the UK has the most beautiful coast in Europe. It’s very addicting to go there. The weather was amazing. Almost every day between 25-30C. I love the country. Everybody seems so relaxed when you compare it to Holland. Yes, Ingrid I bought the Canon 400D mainly as it had good reviews plus my old Canon lens fitted it. I just took delivery of a 55-250mm IS Canon lens last week which equates to about 300mm on digital.